Versace 19.69 Abbigliamento Sportivo Srl was established in Milan, by Alessandro Versace, in 2001. With his expertise and long experience in design and fashion, Alessandro Versace created a concept highly dominated by the Italian elegance, style and quality. Nowadays, Versace 19.69 Abbigliamento Sportivo Srl, continuing this tradition and vanguard, creates an individual style of lines, forms, and materials, following the contemporary trends and the consumers’ different needs. 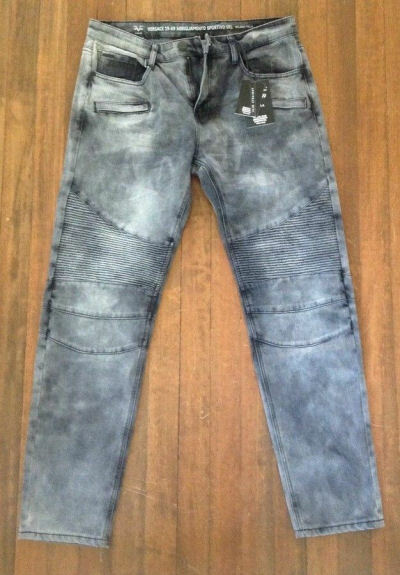 Our Versace 19·69 Jeans are all Brand New and guaranteed 100% Authentic! Versace V1969 Italia Abbigliamento Sportivo SRL Black Premium Stretch Jeans (28W x 30L) (more info) — only 2 left! Versace V1969 Italia Abbigliamento Sportivo SRL Black Premium Stretch Jeans (30W x 30L) (more info) — only 3 left! Versace V1969 Italia Abbigliamento Sportivo SRL Black Premium Stretch Jeans (30W x 32L) (more info) — only 8 left! Versace V1969 Italia Abbigliamento Sportivo SRL Black Premium Stretch Jeans (32W x 30L) (more info) — SOLD OUT! Versace V1969 Italia Abbigliamento Sportivo SRL Black Premium Stretch Jeans (32W x 32L) (more info) — only 1 left! Versace V1969 Italia Abbigliamento Sportivo SRL Black Premium Stretch Jeans (34W x 30L) (more info) — SOLD OUT! Versace V1969 Italia Abbigliamento Sportivo SRL Black Premium Stretch Jeans (34W x 32L) (more info) — SOLD OUT! Versace V1969 Italia Abbigliamento Sportivo SRL Black Premium Stretch Jeans (36W x 30L) (more info) — SOLD OUT! Versace V1969 Italia Abbigliamento Sportivo SRL Black Premium Stretch Jeans (36W x 32L) (more info) — SOLD OUT! Versace V1969 Italia Abbigliamento Sportivo SRL Black Premium Stretch Jeans (38W x 32L) (more info) — SOLD OUT!